Bill Ward has revealed that there are unreleased Black Sabbath tracks locked away in the vaults. 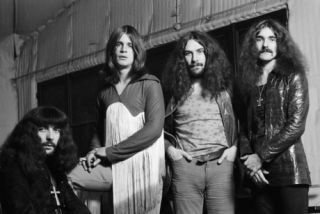 The metal pioneer told Sonic Excess that there is a raft of material recorded by Sabbath during their reunion stint around seven years ago. He said: "It is true that there is a lot of material written and stored away in a very safe place. I don't know what Sabbath album it would be comparable to. "The songs have some brilliant riffs, obviously from Tony [Iommi, guitar], and my drumming has changed a little bit. My approach and Geezer's [Butler, bass] approach was a bit different in supporting Tony, I thought. Oz [Ozzy Osbourne, vocals] was cutting across with some really nice things as well. "I think it was more mature, because we are more mature, even though we are kids at heart. I don't think I can compare it to any Sabbath album, but it sounded really, really, strong." Unfortunately for fans of Bill's awesomely-powerful drumming, the veteran sticksman admitted that he's unsure whether the tracks will ever see the light of day. Back in Rhythm 175 we caught up with Bill and got the lowdown on his role in the birth of heavy metal. You can order yourself a copy here.